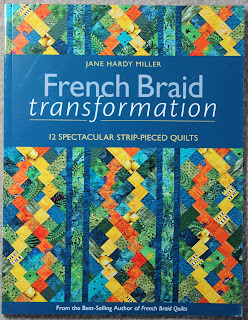 February's Book of the Month was Jane Hardy Miller's French Braid Transformation. I enjoyed this book, as there were clear instructions for each quilt, and for each size. I chose "Stacks", using up fabrics from my stash. Here's a picture of the quilting. Love the feathers! I was in a bit of a hurry to get Stacks done, so I did a fold over binding, instructions for which can be found here. And because I had leftover blocks, I made a second one, Stacks II, with a slight variation: no side sashing, three columns of blocks, , and a top border piece. Hope to get another done from the book, but it is almost time for the March Book of the Month! very pretty, I adore the quilting! Ps. Please consider not using word verification, it makes it so very difficult to post a comment. Oh, the fabrics are great. Love the dots and brights. The quilting choice really worked on these two.